The outline of Britain familiar to us today is a brief snapshot of a continually changing land. Discover how the reshaping of the landscape over the past million years affected the presence of humans. 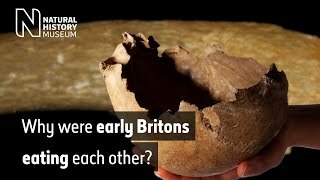 Early occupants of Britain encountered a very different place to the one we know today. At times, conditions were warm enough for hippopotamuses to wallow in rivers. At others, Britain was gripped by severe cold stages and large ice sheets covered much of the landscape, with little life able to survive in the frozen wilderness beyond. 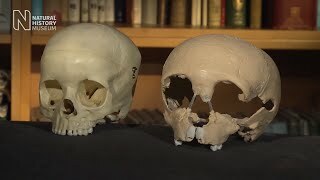 Prof Chris Stringer, Museum human origins expert, says, 'The notion that human territories expanded and contracted as the environments around them transformed is integral to understanding the story of humans in Europe, and particularly in Britain. A broad natural land bridge connects southeast Britain to mainland Europe. Footprints and stone tools at Happisburgh, Norfolk, were left behind by members of an unknown human species who crossed this bridge, becoming the first known Britons. Nearly half a million years later, Britain remains connected to the continent. Human bones and teeth found at Boxgrove, West Sussex, reveal the identity of Britain's inhabitants at this time: Homo heidelbergensis. At the peak of the harshest glaciation, Britain is too cold for humans to survive. Thick ice sheets extend across northern Europe. An enormous glacial lake builds up to the east. When it finally breaks free, its force rips through the land, forming the beginnings of the English Channel. Temperatures have warmed and the ice has thawed. The sea has risen to present-day levels, but Britain is still connected to northern Europe by a narrow land bridge. This has allowed early Neanderthals, Homo neanderthalensis, to colonise Britain. Over the next 350,000 years Neanderthals retreat from and return to Britain as temperatures fluctuate. Britain is an island. Higher than today, the sea submerges low-lying land, such as parts of Norfolk and Lincolnshire around the Wash. In the warm climate, hippos wallow in the River Thames and lions prowl where Trafalgar Square now stands. These animals got here as the sea levels rose, before the land was cut off. Neanderthals didn’t make it in time, leaving Britain deserted by humans. Sea levels drop as water freezes into ice caps and glaciers, creating a vast grass-covered plain between England and the continent. 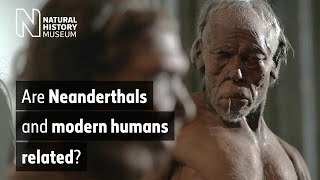 Neanderthals finally return. A jaw bone found deep in a cave near Torquay on the south coast reveals that within 20,000 years the species Homo sapiens also arrives in Britain. The most recent glacial period is at its most severe. Ice covers much of Britain again. As conditions start to deteriorate about 25,000 years ago, humans disappear from Britain once more. After a prolonged absence that lasts more than 10,000 years, our species eventually returns. Warmer now, the ice has melted and over the past 12,000 years sea levels have risen once again, forming Britain's familiar outline. But the coast is never static - it will continue to change as sea levels rise and fall. As the sea erodes the coastline, it is exposing intriguing new evidence of Britain's early occupants.